What Are the Health Benefits of Gymnastics? What Are the Benefits of Running Track? Running is an effective way to increase your cardiovascular fitness, lose weight, and even reverse bone loss. In addition to these benefits, running track promotes competition and encourages you to improve your running ability while promoting teamwork. No one expects to eat three cheeseburgers and fries and then go out and set a personal record at a track meet. Coaches encourage athletes to eat properly before and after races. You perform better and feel better when you have proper nutrition during training. A healthy diet allows you to perform to the best of your abilities, so when you are running track you tend to have a more healthy diet. Track is an individual as well as team sport. 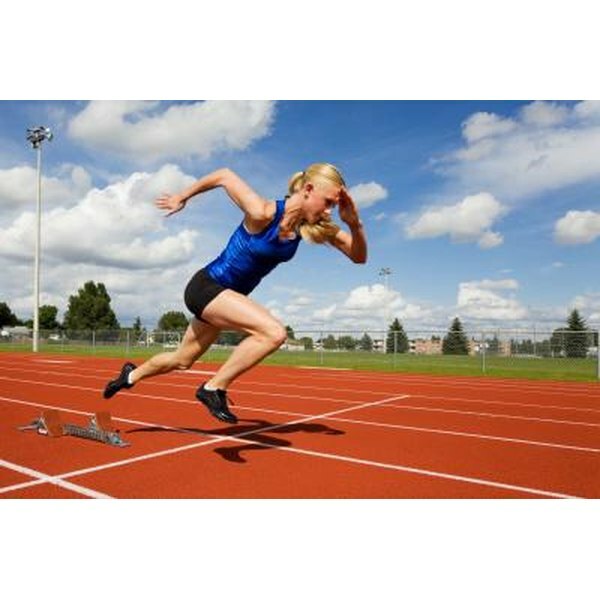 How you perform affects the team, especially in situations such as relay races. All four members are equally important in the race. Each plays a role in the team's efforts to win. If even one runner does not perform at his best, the whole team may suffer or have to compensate to make up for his weakness. In addition to this team bond at track meets, friendships are formed during practices. Runners are expected to train daily and have to endure workouts together. This forms bonds that help make the team stronger. Running improves your cardiovascular fitness, as well as decreases your risk of a stroke or heart attack. If these habits are started at an early age, then you are more likely to incorporate them in your daily activities. Running also burns fat and increases muscle tone. According to the CDC, "An estimated 17 percent of children and adolescents ages 2-19 years are obese." These statistics only reinforce that running through an organized source, such as track, can improve a participant's life, not just health. Kara Dickerson started writing in 2010, with her health and fitness-related articles appearing on LIVESTRONG.COM and eHow. She is a registered nurse on a cardiac stepdown unit, a certified personal trainer at East Tennessee State University and a fitness instructor. Dickerson received her Bachelor of Science in nursing from East Tennessee State University.